When Elizabeth and Peter Mulholland decided they wanted to start making cave-aged cheeses, they figured there was only one place to start: build a cave. 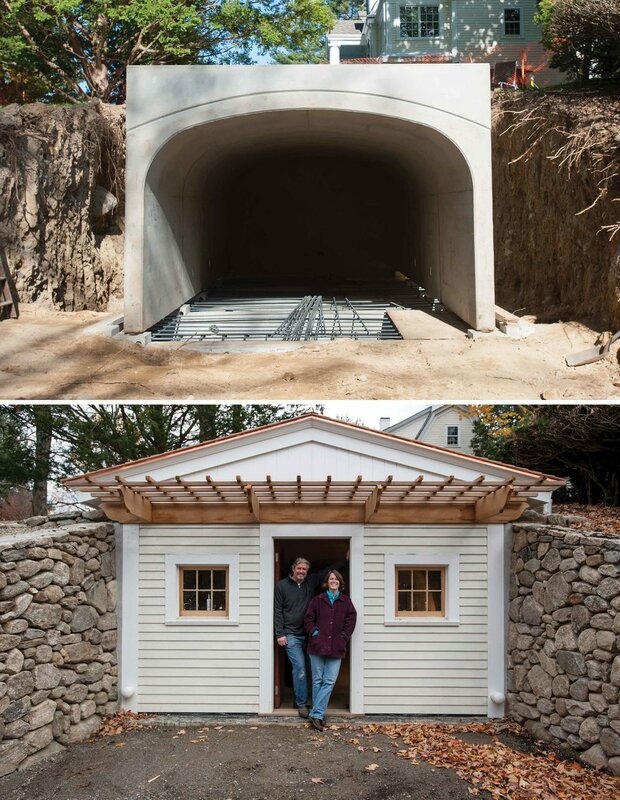 This might seem rather obvious and simple to those of us who know more about eating cheese than making it, but for the husband and wife team behind Topsfield’s Valley View Farmstead Cheeses, the decision to build an authentic, underground cheese cave was one that took years of dreaming and planning. Surprisingly, there are very few cheese caves in the United States that are actually built into the ground. Most cheese “caves” are above-ground, walk-in refrigerators (even if they are the size of caves). 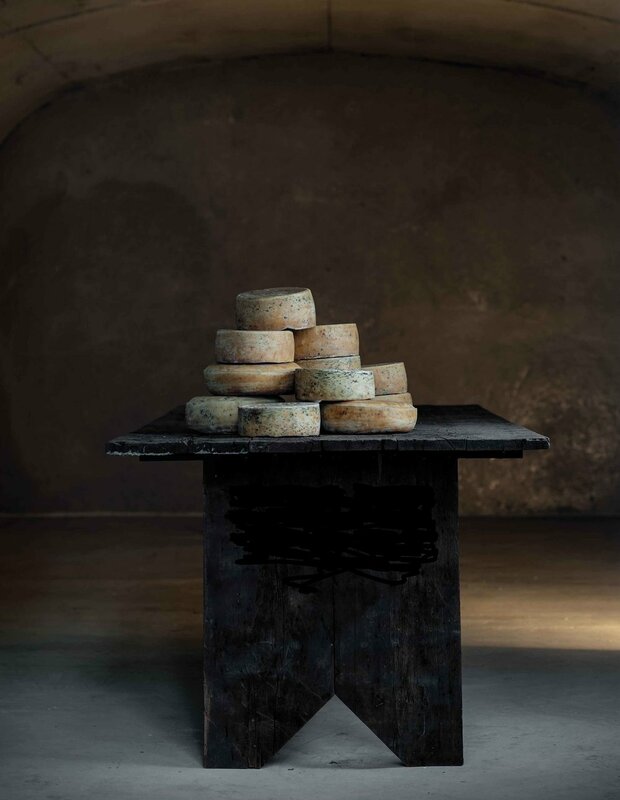 Cheese can certainly be aged in these coolers, but there is an irreplaceable authenticity that comes with aging cheeses in a natural environment, allowing their flavors and textures to develop as they take on the terroir of a specific place, time, and climate. Underground caves are more energy efficient than walk-in coolers, too, and their natural environment is easier to control with less maintenance. So even though the construction of an underground cave is typically three times more expensive than the purchase of a cooler, the Mulhollands are convinced that their investment will end up being a fantastic idea. I think we’ll all agree. It’s an unseasonably warm day in October when I first pull into the driveway of Valley View Farm. Thirty feet away, a small crew methodically stacks rocks of various shapes and sizes, building the retaining walls that lead into Essex County’s first and only underground cheese cave. The leaves are falling from tulip poplar trees that were planted throughout the property by one of the farm’s previous owners who, as a former president of the Massachusetts Horticultural Society, had a thing for special trees. As it turns out, these “goat potato chips,” and the leaves from other unique trees scattered around the property, now play a key role in maintaining the Northeastern terroir of the handcrafted, farmstead goat milk cheeses produced at Valley View. Elizabeth manages everything from the farm’s breeding program, the necessary paperwork to keep the dairy running, and the late-night, mid-winter births of every kid. Peter manages the morning milkings and designs the cheese recipes, all while running back and forth between the farm and his 9-5 job in downtown Topsfield. Mary takes care of hand-feeding every kid born on the farm and manages the local deliveries. The 7-acre parcel that is home to Valley View Farm actually belongs to Mary, who lives in the original farmhouse with Elizabeth, Peter, Andrew, and Henry. “We simply couldn’t do this without my mom,” Elizabeth says. In 1994, after she returned home from graduate school to Peter, who in her absence had fallen in love with farm life, the couple adopted a pair of baby goats from a friend. “They were just so cute,” says Elizabeth, trying to remember what in the world made them want to adopt goats in the first place. The fact that the two babies were Nubian goats was a fortuitous—Nubians, with their long, floppy ears and sociable, outgoing temperaments, produce sweet milk that is high in butterfat and ideal for making cheese. As we walk into the cement-lined dome of their new cheese cave, located under the hill next to the milking parlor and dairy, Peter explains with equal parts humility and enthusiasm how over the course of several years they came to realize that their success, while wonderful, was also daunting. Demand for their cheeses continued to increase, while their production facilities limited what they could do. Like many small food producers, the Mulhollands walk the fine line between maintaining the values of a small, family-run, farmstead production and meeting the demands of a growing business. When the reality of production limitations (and Peter’s incessant need to tinker and play with new cheeses) set in, they decided that building an authentic, underground, old-world style cheese cave was the next step that would allow them to grow the business and help achieve farm sustainability while also maintaining their production philosophy. The Mulhollands knew they wanted to make harder styles of cheese, like cheddars and Tommes, so they were able to design a cave with this in mind. Harder cheeses need 48 to 55-degree Fahrenheit temperatures to allow bacteria to ripen the cheeses at the correct rate. They also need 85% relative humidity to maintain a level of moisture appropriate for different types of cheeses. To cave-age their Camembert-style cheeses, they would have needed a separate space that would not only provide a different temperature and humidity level, but also isolate the specific molds used to produce the pure white rinds of these types of cheeses. The cave’s 8-inch thick walls and bridge arch ceilings are made of cement, which helps naturally regulate the temperature and humidity in the cave according to that of the surrounding earth. In the warmest New England summer months, chilled water will be piped under the barn to a custom stainless steel coil in the back of the cave, naturally cooling the temperature. Lime wash coats the cave’s interior surface—it is vapor-permeable and lets the structure breathe, which is key for air circulation. The rounded arch ceilings help this, too, as they allow for air to move easily throughout. “They also give a more old-world look to the cave,” admits Peter. With the temperature and humidity levels regulated, the last component to tackle is air ventilation. “Ventilation is very important,” says Peter. “A full room of cheese releases gases and the air becomes stale if there is no fresh new air. We have over 200 feet of buried 4-inch PVC pipe underground to bring in geothermal cooled or warmed new air. The air will be conditioned to the earth’s temperature before entering the cave, no matter the season.” Air ventilation will also allow the flora on the rinds of the cheeses to take on the natural molds in the air. As one might guess, building a cave into the side of a hill takes significant investment of sweat and cash equity. Because of the cave’s energy efficient, geo-thermal design, Valley View was able to secure two $25,000 grants from the Massachusetts Department of Agriculture in 2012: the first through the Farm Viability Enhancement Program, and the second through the Agricultural Energy Grant Program. The grants, along with the Mulhollands’ personal investment, allowed them to begin construction. While they were willing to make their own investment, they had no idea how much outside support they would receive. Elizabeth says, “It is really quite amazing to us how people respond so willingly and want to participate,” as evidenced by the in-kind donations of plumbing, carpentry, excavation, landscaping, construction, and hours of manual labor given to help Peter build the cave from the ground up. After realizing the magnitude of their new project, Elizabeth and Peter launched an $18,000 fundraising campaign on Kickstarter on September 6, 2013. The response was immediately positive and far-reaching. “It makes us really excited to keep doing it. It’s incredibly humbling,” Elizabeth says of the outpouring of support they’ve received. With renewed confidence in their project, they increased their Kickstarter goal to $25,000 to cover the costs of backfilling the cave, building the front façade designed to fit in with the architecture of the property, constructing the retaining walls that lead to the cave’s entrance, and outfitting the interior with ash boards for storing cheeses and a retail space in the front of the cave. With the fundraising complete, the cave nearly finished, and the cheeses ready for aging, the Mulhollands’ dream is about to become a reality. Given the added space that the cave provides, Peter hopes that in five years they’ll reach 20,000 to 25,000 pounds of cheese produced annually. The newest Valley View farmstead cheese is called “Pingree Hill Tomme”—aptly named after the drumlin on which Valley View Farm resides, and yet another nod to their beloved terroir.